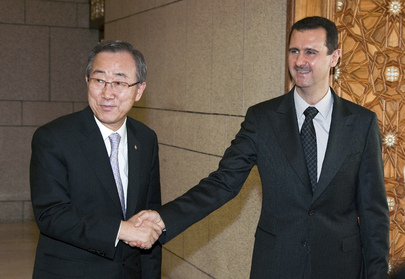 UNITED NATIONS, August 22 -- "It is troubling that [Assad] has not kept his word" about stopping military operations, UN Secretary General Ban Ki-moon told Inner City Press on Monday, five days after Ban quoted Assad on August 17 that "military operations had stopped." Inner City Press twice last week asked Ban's acting deputy spokesman Farhan Haq if Ban believed Assad's statement, despite what was seen even on television. Haq said Ban thought an investigation should take place. Inner City Press: On Syria, you had said that President Assad said that military and police operations, when you spoke with him. Since then, according to Navi Pillay, 39 more people have been killed. Did you ever believe that statement? Do you believe it now and what should be done? SG Ban: This is what he clearly told me when I had the telephone talk with him and he assured me that the humanitarian assistance assessment team will be able to visit different places. And, as you know, our team is already in Syria - they are now assessing the situation. It is troubling that he has not kept his word. Many world leaders have been speaking to him to halt immediately military operations that are killing his own people, and he assured me [he would] do that and military operations have already stopped. Now he has seen and he has heard all these serious and urgent calls to him, and I sincerely hope that he heeds the international community’s appeal and call. Meanwhile the UN humanitarian assessment team fled Hom under fire. A Ban Ki-moon administration official on Monday predicted to Inner City Press that events in Tripoli would make Assad "crack down harder" to avoid Gaddafi's fate. Another told Inner City Press that it was Assad who called Ban, and not the other way around -- Assad called Ban looking for ground cover. Given the invisibility at the crucial moment of Ban's two Libya envoys / advisers Ian Martin and Al Khatib, the question of whether Ban will try to appoint an envoy to Syria "is moot," one said -- it wouldn't make any difference. Watch this site.